On the 3rd May, BACA held another successful training event at the RAF Club in London. The event sought to identify key risks in the modern air charter broking transaction process and to provide guidance on how to minimise them and avoid pitfalls. All of the speakers made clear that the key to protecting any business lies in strong systems and controls, training of staff and constant vigilance. The afternoon began with a panel of experts comprising of Phil Becket from Alvarez & Marsal, Ray Aghaian of Kilpatrick Townsend & Stockton and Ben Watts of PrivateFly discussing the causes, impact and implications of cybercrime. Phil and Ray are experts in cybercrime prevention and investigation and provided insight into the current risks facing the market across the globe. Ben Watts emphasised that staff training and due diligence are two of the best ways of dealing with potential threats and data breaches. The panel session was followed by a presentation by Graham York of Seed Cloud, who gave the audience a glimpse into the future. He demonstrated that blockchain technology can minimise the risk of data breaches while increasing efficiency and security by encrypted communications and peer to peer direct exchanges of information, data and payments. He is launching a solution for the air charter market, called Volavia. He also outlined a potential change in data control, whereby individuals will control their own data and companies will view, but not store any of it. 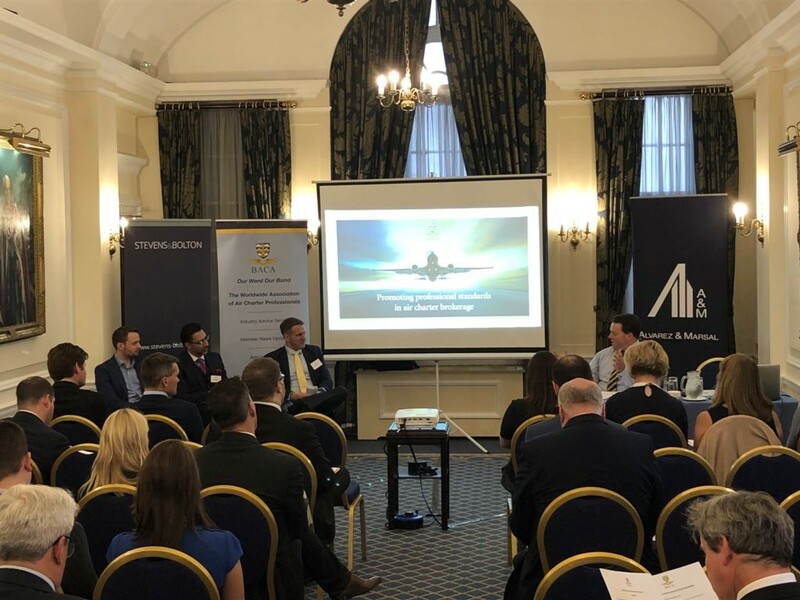 Matthew Day of Haywards Aviation advised that while it is apparent that 75% of cyber threats are from external sources, many involve internal employees or contractors. These include disgruntled employees taking malicious action or accidents, such as leaving a laptop on a train. He distinguished the difference between cyber risk and cybercrime and emphasised that they should be viewed separately. The chief risk is in protecting data and this means that good data management is an important factor in protecting against crime and cyber threats. The training session concluded with presentations from Ray Aghaian of Kilpatrick Townsend &Stockton followed by Nicola Broadhurst of Stevens & Bolton. The audience was alerted to the far reaching powers of the US Authorities, who are heavily resourced and motivated to take enforcement action. If any US laws have been broken and an American corporation is in some way involved in the transaction, the law-breaking companies and/or individuals may find themselves being prosecuted. Any members with business in the US needs to be keenly aware of anti-corruption and sanctions legislation. The session concluded with Nicola Broadhurst advising of recent changes in charges by card purchasing and the implications and requirements of GDPR, including data management, data collection and communications with clients. These have significant implications for air charter market business and all members need to make sure that they are compliant.